Whether it’s a family reunion, wedding, corporate event, or a concert, there are a lot of details that go into planning an event. From the guest list to food to location to entertainment to party favors and party rentals — if you haven’t been through the process before, it can be overwhelming to say the least. 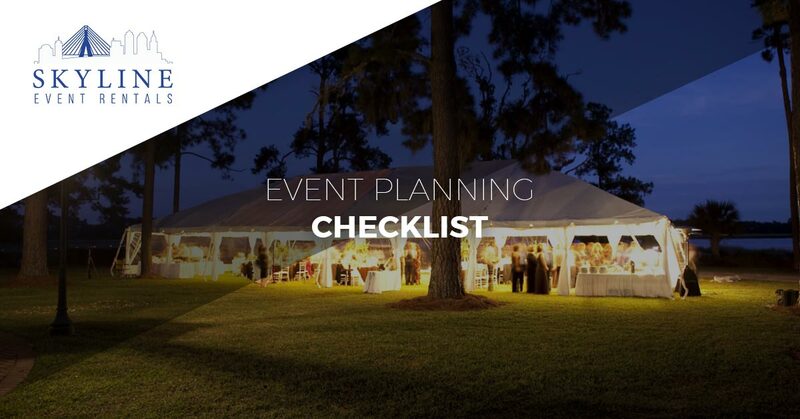 To help you plan and throw an event, here’s a quick checklist to help make sure that it all goes off without a hitch. For the sake of convenience, we’ll use a corporate event as an example. Establishing goals: What’s the purpose? How many people will attend? Budget: Put together a rough budget. When you have an estimated guest list, you can determine how much money you want to spend per person. And always be sure to give yourself some emergency funds. Select a date: Take into consideration when the holidays are and when people will most likely be out of the office for vacation. Choose a theme: Party themes can range from fun and entertaining to serious and educational. If you’re planning a holiday party, fun is better, right? Getting closer to the event, you’ll need to start narrowing down your budget, start getting vendor quotes, and really start to put the pieces of the event together. Speaker: If you’re inviting a speaker to the event, first make sure the person you want is available. Then, set up travel arrangements if necessary and get together information about the speaker so they can be introduced. Send your invitations: An official invitation should be sent out to everyone so that they have enough time to plan their schedule. Book your vendors: This is the time to nail down and make a reservation for any vendors, including caterers, musicians, any entertainment, and party rentals, such as tents, tables, linens, and chairs. Venue details: At the venue, make sure they have all of the necessary A/V equipment, that they’re prepared for your caterer, and check to see if you need any permits, licenses, or insurance. Now that the big details are in order, it’s time to start sending out reminders for guests that still need to R.S.V.P., and send reminders to vendors, speakers, or anyone else who will be attending. Send details to guests regarding where to park and any other necessary specifics they should know. Finalize any entertainment, such as playlists or videos. Communication is essential at this point. With so many people involved, and people with various responsibilities, this is a common time to drop the ball. Vendors: Make sure everyone is aware of when they need to be at the venue. Finalize the schedule of the event. Make sure all vendors have been paid so you don’t need to worry about resolving invoices the day of. Set up decorations if you have access to the venue. With everything in order, from guests to party rentals and the catering menu, now you can sit back and enjoy the big day! A holiday party is for the company employees as well as the organizers, right? Serving Carlisle, Mass., and the surrounding areas, Skyline Event Rentals delivers quality party rentals, including tents, tables, chairs, linens, and more. Our family-owned business is dedicated to providing affordable products and superior customer service. View our profile to read some reviews and learn about our party rentals by visiting our website.